#ISAms Social tweeting at marketing summit! The city of Austin in Texas USA was the venue for 7th ISA Marketing and Sales Summit. Though not as many people attended as did their Water and Waste Seminar the previous week the twitter buzz was if anything twice as active. This year however the event was not tranmitted simultaneously over the net so those unlucky enough not to attend had to rely on a fairly steady flow of tweets from attendees to keep up with things. I’ll try and give a virtual flavour of the event as it appeared to somebody seven hours or so ahead of all the action! Networking at #ISAms 2012: Here the social media was liquid rather than virtual! It seemed to run fairly much in line with the previously published programme. The first day started with a call to the lobby of the venue for a tour of the local TECO/Westinghouse Wind Turbines facility. There was little tweeting on that but from what little there was it appeared to go swimmingly (Are we mixing metaphors or something here?). 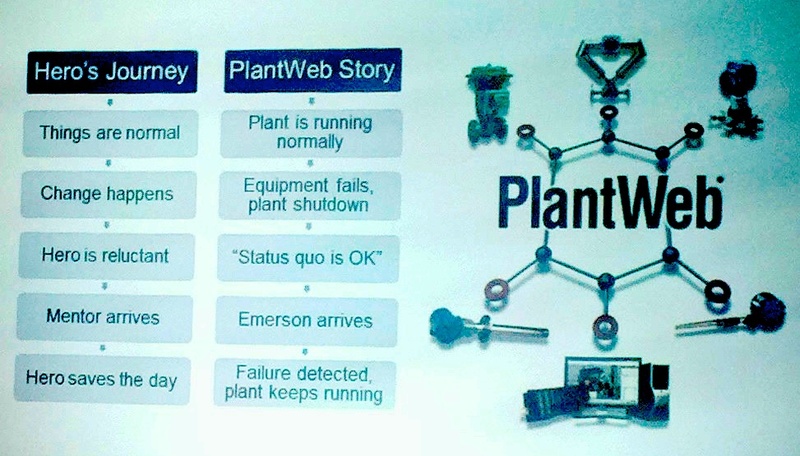 The keynote was given by another speaker from Emerson, (There were three speakers from this company and their contributions were commented on by Jim Cahill in his blog “Connecting Process Manufacturers and Automation Suppliers”) . Jane Lansing is Vice President of Marketing for Emerson. She shared her view of Plantlandia during the opening Keynote session of the Summit. Again the tweets are illuminationg. 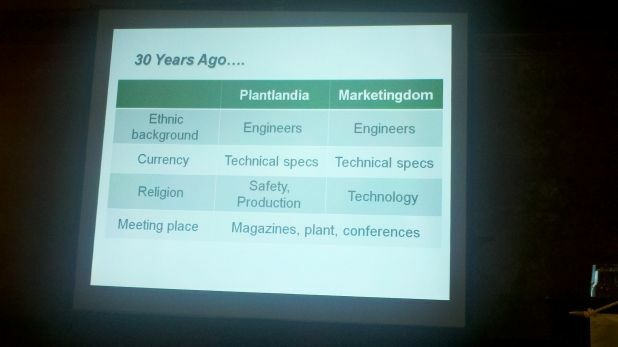 “We live in Marketingdom and our customers live in Plantlandia.” So it appears that there is a possible disjointedness there! “We speak marketing-speak and our customers speak plantlandese. We don’t go home at night and operate a chemical plant.” “Plantlandites do NOT understand TLAs (three letter acronyms!) They are a terrible disease in our industry! “ “We need to do a better job to meet and communicate with our customers where they are…vs where we are!” There are other problems like where the market is and how marketing and how the customer accesses information has changed in the last thirty years. Thirty years ago, but today is different! This keynote was followed by a networking break and a brek-out session. The flow of tweets lessened during these breaks and became slightly disjointed as they came from different threads! There were some interesting contributions though. “Automation marketers hesitant to embrace Twitter. Think of it as your own headline broadcast service 4 any content you create” And this from Gary Mintchell of Automation World, “Marketers still searching for nirvanna of community. Reminds me of AOL in 1993.” (AOL=America On-Line an early ubiquitous giant in the early days of the internet!). What story are you telling about your products! The third speaker from Emerson was Mike Boudreaux. He was on deck to talk about storytelling in sales and marketing and he proved to be a very entertaining speaker. Indeed one delegate was moved to tweet, “When was last time you laughed and cried in one presentation? @MikeBoudreaux rocks storytelling.” He showed “how to talk to lizard, mammal and human brains using funny and heartbreaking commercials as examples.” “Message, Plot, Conflict, Character, these are the keys to good marketing stories. “ Emotion-packed, compelling stories make the best sell in any marketing context. He used the marketing excercise of PlantWeb to illustrate his points. (OK he’s biased but it is his experience being used to illustrate what he is trying to say!). How the plant lived happily ever after! • Mike has published his presentation on SlideShare: What story are you telling about your products! A fascinating tweet was that Joel Don (of Comm Strategies) promises to give us an ironclad ROI formula for social media. (another TLA – ROI=Return on Investment!) but the subsequent tweets seemed not to tell us any more though he himself did have one or two gems including this one which is often overlooked: “Social media is not a strategy. It is a communications tool.” Serendipitously I came across Seth Godin’s blog the next morning where he wrote about the case of marketing failure by Progressive Insurance, “Corporations are not people,” which failure, Joel later told me, was used as an example in his presentation. “Most product data gen’d by prod mgrs lives in excel and is disconnected from everything -not helping any one said” from Radhika Subramanian of Emcien and Kate Laneve of NCR, talking about the big data challenge of Transforming the Sales Approach From Reactive Selling to Demand Shaping. Kyoko Fukuda of Yokogawa spoke about marketing after an Earthquake disaster. This was followed by a “Speed dating” session with 25 mins on each subject ” Social Media, Sales, and Voice of the Customer.” I’m not to sure how that was organised but it looks like it was an effective way of sharing information. There were many other tweets a which I haven’t covered. It is to be hoped that the presentations will be made available on line and if and when they are we will put a link to them here. Here is the facebook page for the M&S Summit! Apologies for the disjointed nature of this posting but hopefully readers will get a general flavour of the exciting event and perhaps tempt him or her to arrange to attend the Eight Marketing & Sales Summit wich is scheduled for New Orleans in 11-13th September 2012. Finally Jim Cahill shared a little cartoon strip. I think he was being humorous, but could it be that there is a message for sombody here? 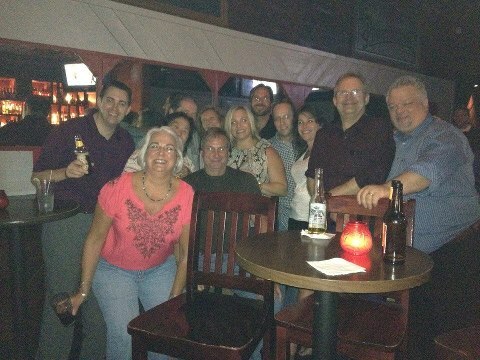 This entry was posted on Monday, August 20th, 2012 at 1:37 am and is filed under Events, Marketing, Training/Education. You can follow any responses to this entry through the RSS 2.0 feed. You can leave a response, or trackback from your own site. 5 Responses to #ISAms Social tweeting at marketing summit! Eoin, Great post! It’s truly amazing you weren’t with us in person, given this great coverage. I do confess to liking the Dilbert posts that take aim at marketing and sales folks of which I’m a proud member. Jim is right, Eoin. It seems like you were there. Thanks for the great coverage. Hope to see you in New Orleans next year. Great summary Eoin. Hopefully we can see you in person at some future Marketing and Sales Summit.